Fresh off a disappointing loss in Greystones, Wesley 3rds were keen to make amends against a strong Lansdowne team. So keen in fact that during the week the forwards did the unthinkable and requested scrum training. Wesley chose to play with the wind in the first half, playing toward the Wesley end but despite this they fell under some early pressure. A number of handling errors and a few questionable calls from the strangely quiet ref left Wesley camped in their own 22 for a long 20 minutes. Lansdowne missed an early penalty as they struggled to break Wesley’s strong defence led by the centres Paddy, Luke and the back row. Lansdowne’s struggles were compounded after a pass was intercepted by Mark which allowed him to waltz over from 80m, 7-0. After this Wesley began to improve and the scrum training from during the week was evident but the handling errors persisted meaning little attacking rugby was seen for the rest of the half. 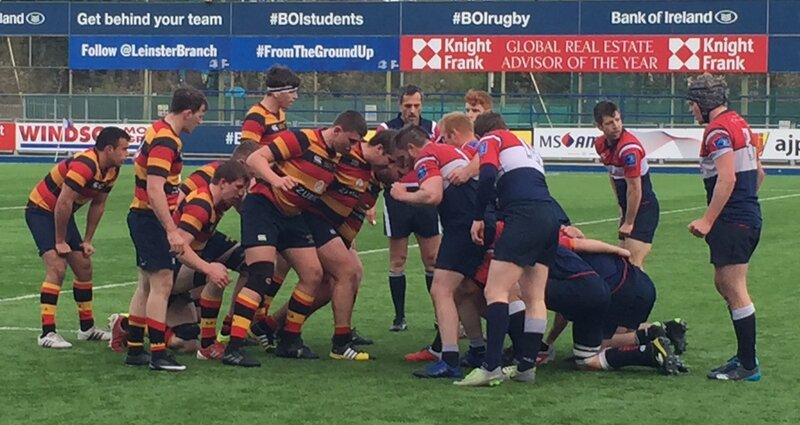 The second half efforts from Wesley mirrored the first half offering a resolute defence against Lansdowne’s efforts. Wesley offered the occasional riposte out of defence on turnovers, which were cut short of relieving the pressure due to uncharacteristic errors in handling in contact continuing to give Lansdowne chances in Wesley territory. From turnovers Wesley looked capable of breaking out of defence at will and one such turnover mid way through the second half, enabled Wesley to surged up the pitch to Lansdowne’s 22. Conor, the older of the Boydy brothers, was enticed to run at Lansdowne’s unsteady defensive line by an excellent pass from the scrum half Ben. He broke the initial defensive line, continuing deep into the 22 before being hauled down on the 5 metre line by desperate tackles from Lansdowne’s cover defence. One of the first to arrive at the ensuing ruck was Scott McDonnell, who’s face lit up in joy, as he scooped up the ball and powered over the line to score. Lansdowne returned to pressure Wesley territory following the try but the Wesley defence held firm. The Wesley front five’s flat refusal to give Lansdowne a solid scrum or line out, combined with smothering defence from the back line stifled any attacking edge from Lansdowne. Ken McLaughlin lead another break out later in the half and his pass unlocking the back line from deep. Interplay between Paddy and Mark in the centres sent Mark galloping deep behind the Lansdowne back line, where he put a kick deep into the 22. It was chased by the younger of the Boydy brothers, who, bearing down upon the Lansdowne full back, forced the error in recovering the ball and pounced on the free ball dotting it down for Wesley’s third score of the game. With a lead of 17-0 and a resolute defence Wesley succeed in closing out the game for a well deserved victory.